The trip of 16 days will immerse you in the world heritages, beautiful sights as well as friendly people. Start from Siem Reap - Cambodia to discover the Angkor complex with countless materpieces of Khemer architecture. Experience speedboat from Phnom Penh to Chau Doc - Vietnam then visit most of highlights: floating market, Cu Chi tunnels, Hoi An - Hue, Halong bay and finish in Hanoi. Welcome to Siem Reap. Brief itinerary and transfer to city centre. After a short break, start your tour to the incredible temple Ta Prohm. There are enormous fig trees and gigantic creepers which embrace themselves in the stone foundations of the structure giving the impression of man's creation being reclaimed by the powerful forces of nature. You also explore the grand circuit with Preah Khan, Kravan, Neak Pean, Krol Ko, Ta Som, East Mebon and Pre Rup Temples, where you can enjoy the sunset. Enjoy welcomed dinner at the local restaurant. Arrive in Phnom Penh in the early afternoon. After short break, you will visit the interesting sites: The Royal Palace and The Silver pagoda. They offer a display of priceless Buddhist and historical objects. In the later afternoon, take a boat trip to Koh Dach where the Khmer produce their Hol and Pamourng using silk (Hol & Pamourng is a traditional Khmer costume used for special ceremonies or weddings). Enjoy sunset along the Tonle Mekong river. In the morning, you visit to Toul Sleng museum (S-21) and the killing field of Choueng Ek, which is about 35kim away from the city. These places are grim reminders of Cambodia's bloody past under Pol Pot. It is almost inconceivable to confront the nature of true evil here in this gentle land, but the Buddhist memorial at Choeung Ek, commemorates the 1.7 million victims of the 1975-79 Pol Pot regime. This excursion may prove distressing for some. Back to the city centre to catch a speed boat for your river journey to Chau Doc - Vietnam. Boat departure time is 12.30 noon. It takes you about 5 hours including the visa formalities required at the border crossing. Upon arrival at Chau Doc, you will be met by your guide and transferred to your hotel. Following breakfast at the hotel, your Mekong delta exploration begins. You will take a private motorized boat trip to visit a floating village, a floating fish farm and the Cham weaving village. Experience firsthand this village's unique culture and unusual fishing techniques. After that, drive to the heart of Mekong delta - Can tho. Stop to visit a local crocodile farm en route. Upon arrival in Can Tho, you will have chance to visit some of the local farmers along the way and enjoy some beautiful tropical gardens. Check in hotel and free time. After returning to the hotel for check out, you begin our journey to Saigon. Check in hotel and free time. You have free time in Saigon until be transferred to the airport for short flight to Danang. Upon arrival in Danang, pick up and transfer to your hotel in Hoi An. You have chance to visit the fascinating Cham Museum and Marble Mountain en route to charming Hoi An. Check in hotel and free time. After that, board the Red Bridge boat for a leisurely cruise (25 minutes) along the Hoi An River to the Red Bridge Cooking School. On arrival, you explore the cooking school’s herb and vegetable garden, before learning about some of Hoi An’s and Vietnam’s well-known dishes. The cooking lesson runs for about 2 hours - each dish is first demonstrated by the Red Bridge chef’s, before you prepare the same dish youself. Included in the class is a brief introduction to Vietnamese food carving (plate decoration). After the lesson, you can enjoy what you have cooked. Today is your free time in Hoi An. You might like to take a bike tour or leisurely stroll along Cua Dai beach, located about 5km from the town centre or go to the town for tailor made clothes. This morning, you leave Hoi An for Hue. On the way, you will have chance to the fascinating Cham Museum and Marble Mountain en route to charming Hoi An. Upon arrival, you will visit the Citadel and the Forbidden Purple City. You also visit Tu Hieu pagoda and Imperial museum before free time for shopping at the vibrant Dong Ba market. Enjoy breakfast at your hotel and then board a private boat for a cruise on Perfume river. You will visit Thien Mu pagoda and then take a drive to visit Minh Mang tomb before transferring to the airport for flight to Hanoi. In the afternoon, you will walk to visit Hoan Kiem lake, local markets and Hanoi's Old Quarter, known for its 36 streets and former craft guilds. Enjoy a water puppet performance before coming to your hotel. Having breakfast at hotel then start a full day city tour in Hanoi. Start with Ho Chi Minh complex (including Ho Chi Minh’s mausoleum and stilt house); the Presidential Palace, the nearby One Pillar Pagoda and Tran Quoc pagoda on West lake. In the afternoon explore the Temple of Literature, Vietnam’s first university and the Ethnology Museum to learn more about the diversity in ethnic communities of Vietnam. You have free time until be transferred to the airport for your departure flight. End of your tour. Thank you for using our service. See you again. Speed boat Phnom Penh - Chau Doc. 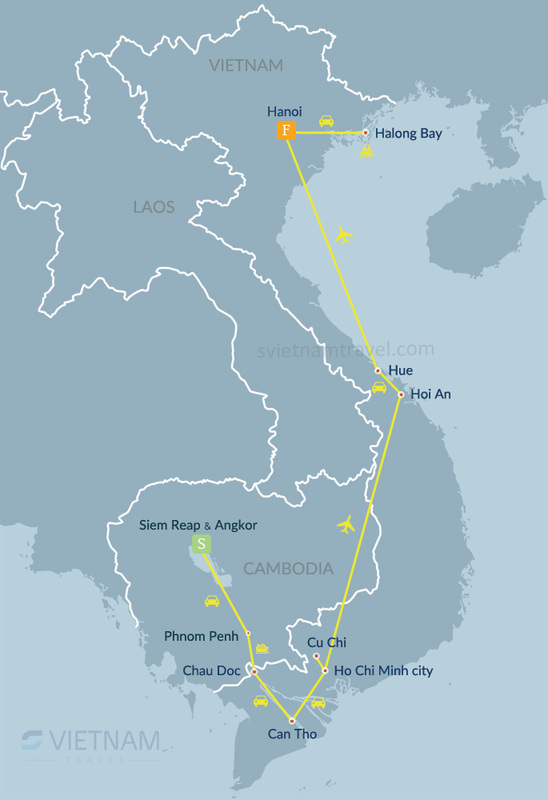 Flight tickets Saigon - Danang, Hue - Hanoi.